- Setting: Help > Advanced > "Verify web browser code signature". - Added the current keyboard layout name to the unlock window. - File > Preferences (Ctrl+P) > Security > Lock when web browser is closed. - The Enter key opens a Login item in the web browser if the 1Password popup menu shows one matching item only. - Ctrl+N should create a new item (not a new vault). 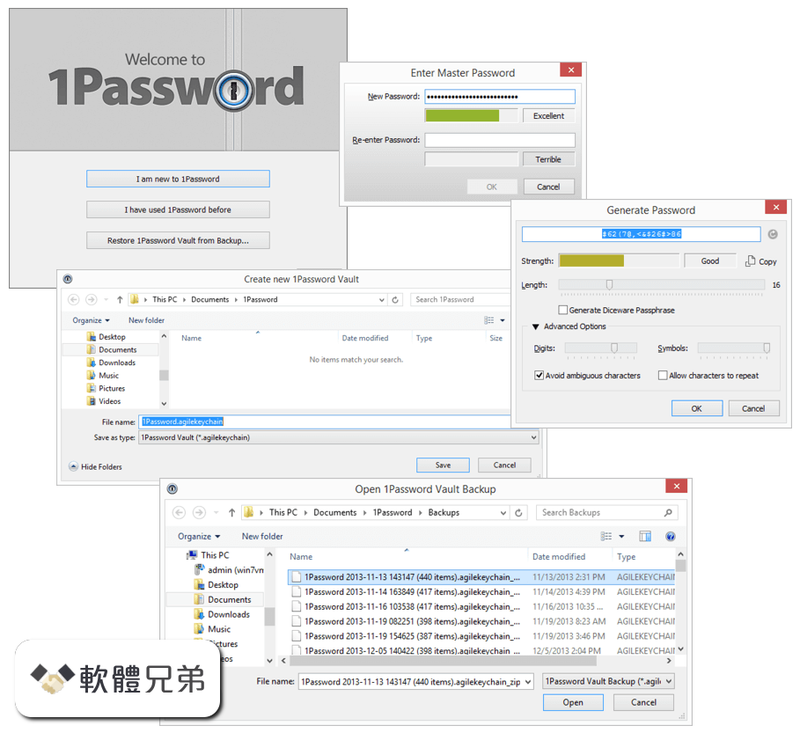 - Added latest version of 1PasswordAnywhere. - The "Scan Dropbox for 1Password Vaults" feature should limit itself to 2 folders deep at most. - Clicking "Last Generated Password" should always copy the password to clipboard. - Added the 30-day trial expiration date to the About dialog. - The agent/helper is not going to install the low-level mouse hook if auto-lock (after X minutes of inactivity) is turned off. - Added "Icon:" label to Software License items. - Updated help links (pointing to https://guides.agilebits.com now). - Updated the list of countries (ISO 3166, June 2014). - Added support for Waterfox web browser. - Updated the 32x32 taskbar icon. - Updated a few icons (courtesy of Jessica Jansen). - Added attachments to Generated Password items. - Added the following custom field types: "URL" and "Email". 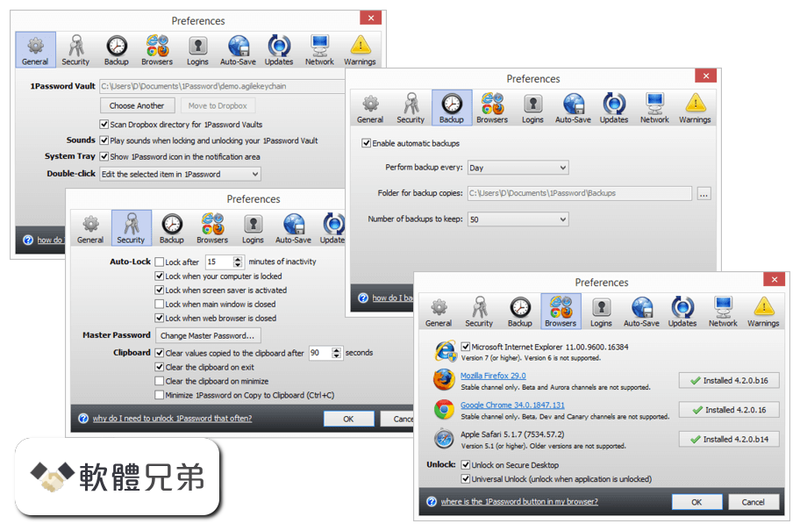 - Added support for Comodo Dragon web browser. - Added some more info about IE to the "enhanced protected mode" error window. - Added "Copy Password" (Ctrl+Shift+C) to the (right-click) popup menu. - Added Wi-Fi Sync log to the diagnostics report. - Improved searching for tags (Alt+DownArrow). - Added spinner to the Wi-Fi Sync window (Ctrl+W). - If you have more than 4 Login items that match the current URL, then the 1Password browser extension will display this: "Show X more items..."
- Notes field in the edit window is resizable. - When editing an item, dynamically disable Up/Down button if it can't do anything. - Added "No to All" button when importing a 1PIF. - Bug: when running .opvault the "New Item" button displays a few deprecated account items. Fixed. Result: a second unlock is required. Expected result: 1Password should be unlocked because "universal unlock" is turned ON. - Bug: Tags are not saved properly when pressing Enter to save. Fixed. - Bug: Inconsistent behavior with automatic section collapsing and up button. Fixed. - Bug: CC item created on Windows does not sync date fields to iOS via Wi-Fi. Fixed. - Bug: the search popup menu (that appears when you immediately start typing) steals the focus from the browser window. Fixed. - Bug: the setting to scan the Dropbox folder is not retained after exiting the program. Fixed. - Bug: when running in IE9, the 1Password extension might mistakenly think EPM is turned on. Fixed. - Bug: http vs. HTTP can prevent icon downloads. Fixed. - Bug: error when trying to add attachment to Generated Password item. Fixed. - Bug: filling a password containing special characters in Internet Explorer results in a failure upon submission. Fixed. - Bug: search in web browser doesn't let you fill into the currently open page and provides Go & Fill only. Fixed. - Bug: after a reboot, 1Password isn't restored to the previous maximized window state. Fixed. - Bug: error when username contains a backslash and the data is imported from 1PIF. Fixed. - Bug: when you assign a custom icon to a Login item, this icon is now visible for ALL of your Logins in the details view. Fixed. - Bug: restarting 1Password helper can cause following error: "Invalid data type. This key was updated via Amazon GPO to fight W32/Lovsan.worm". Fixed. - Bug: the 1Password agent/helper might slow down typing in other apps. Fixed. 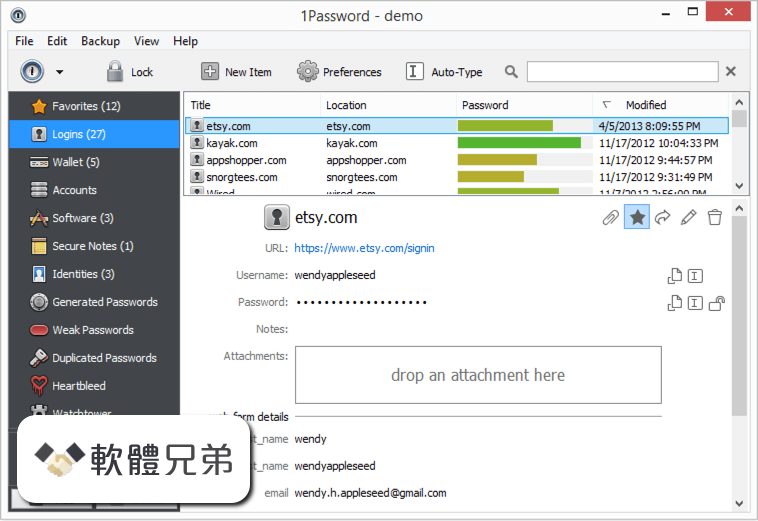 - Bug: memory dump file contains decrypted data when 1Password is locked. Reported by Roger Wolfson. Fixed. - Bug: saving a new Login item in the web browser can cause an access violation. Fixed. - Bug: the old %APPDATA%Agile Web Solutions directory is created when you enter your license key. Fixed. - Bug: Auto-Type does not work in the OneDrive sign-in window (the first character of the user name goes missing). Fixed. - Bug: when you edit a web form field, then the "Generate" button should enable itself if Type *or* Designation is set to "password". Fixed. - Bug: the secret key that is displayed in the Wi-Fi Sync window is not accessible. Fixed. - Bug: Internet Explorer 11 on Windows 7 (64-bit) mistakenly thinks Enhanced Protected Mode is on. Fixed. - Bug: tags should be in alphabetical order. Fixed. - Bug: a restart of 1Password is required after the Bonjour service is installed. Fixed. - Bug: on Russian systems, the close button for tags looks like the Russian letter "?". Fixed. - Bug: collapsed sections will auto expand if any of the Credit Card fields (e.g. Valid From) has been deleted. Fixed. - Bug: when you add (or edit) an identity and then re-size this window on a high-DPI screen, the fields in the left section disappear. Fixed. - Bug: saving a new Login item in the web browser can cause the following error: "Cannot create file XXXXXXXXXXXXXXXXXXXXXXXXXXXXXXXX.png". Fixed. - Bug: Wi-Fi Sync with 1Password 5 (for iOS 8) keeps prompting for the master password. Fixed. - Bug: UI glitch on the lock icon next to the password field (does not reset properly). Fixed. - Bug: if your PC resumes from sleep, then the 1Password agent/helper might stop making backups. Fixed. - Bug: double-click on a Login item opens the URL in the web browser, but does not fill the credentials. Fixed. - Bug: HMAC is not added to .opvault attachments. Fixed. - Bug: the new password window isn't high-DPI aware. Fixed. - Bug: tags are not imported from a 1PIF file. Fixed. - Bug: custom field sorting changes aren't saved. Fixed. - Bug: when you duplicate an item, attachment is NOT duplicated. Fixed. - Bug: 1PIF import not handling escaped quotes in title property value. Fixed. Native Messaging support for 1Password extension in Chrome. OPW-607} ...... 4.1.0.520 (build #520) – released 2014-10-13 – download. What&#39;s new in this version: New: - Setting: View &gt; Show Rich Icons - Setting: Help &gt; Advanced &gt; &quot;Verify web browser code signature&quot;. Download 1Password 7.2.576. 1Password for Windows. August, 13th 2018 - 100% Safe - Trial ... 1Password 4.1.0.520. Date released: 13 Oct 2014 (4 years ago). November 2014. Some more information: Windows platform. Windows 7 Enterprise Service Pack 1; 1Password (4.1.0.520). MAC OSX platform.